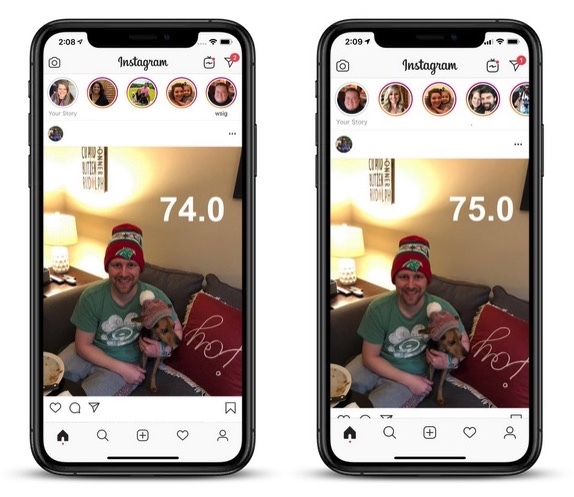 Multiple reports are coming in that Instagram has lost support for iPhone XR and XS Max screen resolutions in the latest update to its iOS app. The issue has been highlighted on Reddit and Twitter after Instagram users updated to the latest version (75.0), which was pushed to the App Store on Wednesday. The resulting effect is that the Instagram interface looks as if it's been zoomed in, leading users to complain about blown out images, fuzzy text, abnormal spacing of icons and other graphical elements. The issue isn't turning up for iPhone XS users who have updated the app, presumably because it shares the same resolution as the 2017 iPhone X. Instagram added support for the new iPhone XR and XS Max screen resolutions in October. Now I know for sure it's not just me:@Instagram for iOS just un-optmized for iPhone XS Max (and presumably XR) screen resolutions in their latest (75.0) update. This is almost certainly an accident on Instagram's part, so it's likely to be fixed in the next update. iPhone XR and XS Max users who are experiencing the issue are advised to hold tight, and anyone who hasn't updated to v75.0 should probably wait until the next version is released. We've reached out to Instagram to find out when that might be and will update this article if we learn more. I’m confused. Is the only difference that the fifth bubble is cut off? If so, that may very well be intentional. It creates an impression that there’s more to the right and they should interact with the bar to see what else is there. Maybe there’s more than five? The five complete circles in the older version doesn’t communicate that. It still could be an accident, but it does create a nice affordance. Is there a more toxic company on this planet than Facebook? Zuckerberg is a childish and evil POS. I was worried people would overreact. Glad I was wrong? The old, rectangular screens were perfectly fine. Now we have a notch that gets in the way of content and so do the overly rounded corners. Design getting in the way of user experience. I noticed this instantly and tried to see if there was an option in settings to change it. Well, thats it. Christmas is officially ruined. There are lots of apps that still aren’t even displaying correctly on the X. Even Safari browsing Reddit often obscures the next button at the bottom of the page. The difference is that it is now going back to the unoptimized state of using iPhone X's resolution and stretching it to fit the XS Max/XR screens. Since the X screen is smaller you now get lower resolution display and all the elements look enlarged.